This clip shows how to join 2 pieces of brass using our SSF-6 silver solder. 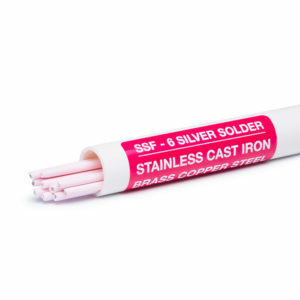 SSF-6 can also be used to join stainless steel, cast iron, steel, bronze, copper, in any combination. Clean the brass before soldering. Never heat the brass bright red as this impedes the flow of SSF-6. Broad heating is important to achieve a nice even flow. Allow the flux to work momentarily before applying the rod.